We are chiefly engaged in manufacturing and exporting world best Over Crank Shearing Machines. The Over Crank Shearing Machine that we offer is specially designed with the help of structural analysis technique, in order to ensure excellent performance, continuous and large-scale production and longer service life. Widely used for different industrial purposes, our Over Crank Shearing Machine are interconnected in design with robustly welded structure of MS plates and other parts to take complete load with least deflection. Stringently inspected by experts, the Over Crank Shearing Machines available with us are the best choice available in the markets. 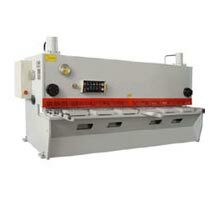 Why Choose Our Over Crank Shearing Machine?